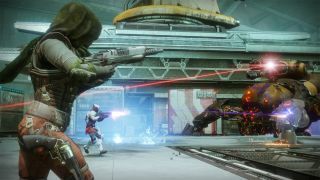 So you’ve hurtled through Destiny 2’s campaign and now everything is in the name of cold hard loot to get that power level creeping up. If you want to be Nightfall and Raid ready you’re going to want to be way above the recommended Power level of 240 so it’s time to get grinding for more guns and armour. One of the absolute best ways to do this is to go to the Public Events marked on the map. While the standard version of a Public Event will hand over a piece of gear and a token, what you’re really looking for is Destiny 2 Heroic Public events. You might have taken part in these already with Guardians who are in the know but here’s how to transform each public event type into a Heroic and snare even more loot. I’ve broken it down by Public Event type. I know there’s a lot to juggle during the Cabal Extraction event, what with all the burning missiles heading your way as well as members of the Red Legion, but you’re going to want to get eyes on the Cabal ship flying overhead and shoot it out of the sky. It does a couple of passes over so you don’t just have one chance but take it out before the drill is deactivated and you’ll turn it into a Heroic Public Event. Those Fallen just love their Glimmer. Instead of just taking down the four targeted Fallen at each extraction site, you’ll also need to destroy the little extraction tool with a blue beam that appears at each site as well as the enemies. It’s not all of those grey things around the outside but a small device that when destroyed at all three sites will upgrade you to a Heroic Public Event. Also worth noting is that the Heroic element adds an extra section to the Public Event. You’ll have to defend a huge pile of Glimmer as you wait for it to be transmatted out so stand on top of it like Smaug on his gold and shoot everything that comes near. Got to love a giant Servitor that transmats you into the sky, right? Well if you too want to be teleported into utter danger, you’ll need to upgrade the Ether Resupply’s Servitor to its Heroic version. The way to do this is simple. Well, kind of. Instead of focussing on the main Servitor, you’ll want to take out all of the little ones that spawn. Not to worry you or anything but they’re on a timer so be speedy and take down the waves. Sure you can take out the Fallen Arsenal Walker by shooting its legs and then little orange engine or you can upgrade it to a double whammy of walkers. The way you’ll need to do this is by using those arc charges it spills out and unlocking all 3 of the arc protected scorch cannons. It takes two arc charges per scorch cannon but it’s worth the extra effort as get them uncovered and you’ll activate the Heroic version. It also makes it a hell of a lot easier to beat the extra walker and the masses of Fallen. Who knows what the Vex are doing under there but let’s stop them, eh? If you want to upgrade this to a Heroic Public event you’re going to have to leap into those three circular plates a little way away from the central spire. Stay in long enough to capture each one, then go onto the next and do the same, and you’ll unlock the Heroic version. Vex Elite add themselves into the mix to make it that little more difficult but you can do it. ‘I love the Taken’ said no one ever. If you’re amidst a Taken Blight Public Event you’ll need to jump inside the big dark dome around each Blight to get a ‘Blight Receding’ buff which will allow you to do damage to the Blight. It won’t be long though so you’ll have to scoot in and out to fully destroy each one. You’ll then need to beat the big bad to finish the Public Event. This one is even more fun than the previous Cabal Extraction. This time as the deadly Scion Majors pummel you, before you have to leave the dome due to the heat, you actually have to stay inside and hunt down the open vents inside the rig. Fire at the vents until they close and do this all over again with the next two Scions. Once you’ve done three, you’ll get the Heroic buff. Of course you’ll also have to beat an upgraded version of the boss too but hey, all the loot is worth it, right?